Blue Bay Resort Hotel is a luxurious seafront property located in the idyllic fishing village of Agia Pelagia, 23 km off Heraklion. Offering majestic views of the blue Aegean Sea, this hilltop resort – built like an amphitheatre on a hill overlooking the Cretan Sea – is located close to the bay of Mononaftis. It is known for its hospitality and wide range of guest amenities, where you can choose from full-board, half-board and all-inclusive options. A perfect destination for a relaxing holiday in Crete, the hotel offers well-furnished, comfortable rooms that combine traditional architecture and modern aesthetics. Relax at its 6 swimming pools and relish the amazing cuisine at its buffet and a la carte restaurants. With an open-air theatre, gym, mini club and sports facilities like tennis, football, basketball, volleyball and mini golf, Blue Bay Resort Hotel Crete ensures a fun, activity-filled vacation for its guests. The kids’ pools and mini club make sure your little ones have enough entertainment throughout your stay. The helpful and friendly staff, coupled with a range of recreation facilities make this hotel an ideal retreat among holidaymakers looking for enjoying the charming Cretan sea and sun. Located in close proximity of bay of Mononaftis (300 m), this resort is 2 km away from the main street of Agia Pelagia. Herkalion, the largest city of Crete, is 23 km away. There are excellent options for water sports at the Agia Pelagia beach nearby, as well as other scenic beaches in the nearby area. The hotel also runs a regular shuttle service to the beach. In Herkalion, guests can explore interesting museums and forts, plus the Herkalion port. The Herkalion Airport is 25 km from the hotel. Blue Bay Resort Hotel has 209 rooms in a range of categories: double rooms, executive rooms, family rooms, luxury rooms and suites. The tastefully-designed rooms with earthy hues come furnished with double or twin beds, television, telephone, minibar (chargeable), private bathroom with amenities, air conditioning, hairdryer, in-room safe box, baby cot and a lot other amenities. Daily housekeeping is also provided. Some of the luxury rooms boast private pools and outdoor Jacuzzis. The resort’s main buffet restaurant Amvrosia serves Cretan, Greek and international dishes in breakfast, lunch and dinner. The a la carte restaurant, Panorama offers a pleasant dinner while overlooking the sea. Alcoholic beverages like wine and beer, or local drinks like ouzo and raki can be enjoyed at the Dionysos bar. The two poolside bars Breeze and Pergola serve light snacks and ice creams in addition to alcoholic and non-alcoholic drinks. 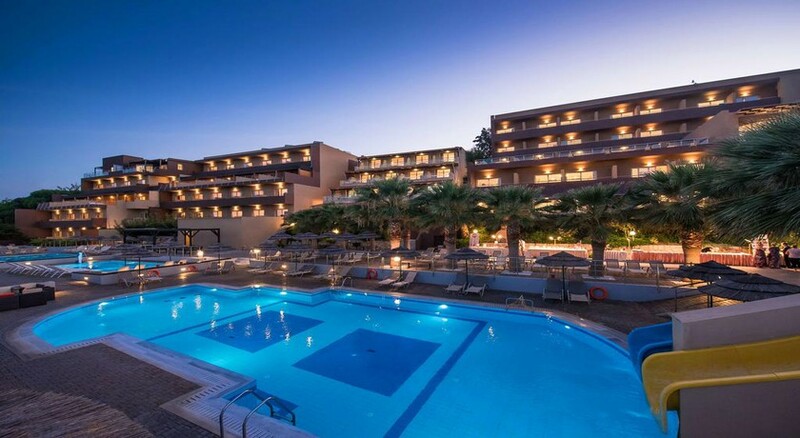 Blue Bay Resort Hotel Crete offers ample amenities for leisure and recreation of its guests. Four swimming pools for adults are surrounded by sunbeds and umbrellas, while the young guests get two paddle pools. There’s also an indoor pool in the spa. the on-site 4 Seasons Spa offers a range of relaxing body and facial treatments, with hydrotherapy, sauna and Turkish bath. There is a multi-purpose court for tennis, basketball and volleyball along with a fitness centre and an aqua gym. The hotel provides facilities for mini golf, table tennis, billiard, archery and pool diving. For kids, the hotel hosts exciting animation shows and features a mini club. Adults can enjoy the weekly theme nights, such as BBQ nights, disco nights, as well as dancing performances and live music. By far the best week away! I went with my partner, we can’t fault anything. The food was amazing especially for all inclusive, views, people, cleanliness, atmosphere all amazing. The beach is a short but hilly walk, beautiful little beach with nice restaurants that are amazing! We ate a few times there just because they were so amazing!! Can’t wait to return! Excellent holiday our only complaint was the lack of spirits available to drink on the all inclusive. If this was rectified they would have got 5 stars. Staff were the best we have encountered in all the hotels visited and they truly made our holiday special. We had the annex pool to ourselves most days, bliss!! Staff were so attentive. Food was excellent, plenty of choice. The chocolate themed evening was truly spectacular. The spa treatment I had was incredible and being able to take a shower there as we had a late flight was an added bonus. The walkway to the spa was so relaxing with the aromas of the herbs and flowers planted along side. We will definitely return to the same hotel. Lovely clean hotel, views were amazing from the Jacuzzi at night, only downside was the limitation on the all inclusive drinks, wine and lager. What a lovely family run hotel. Staff so friendly. Nice rooms all very clean. Great food selection, we went all inclusive. We spent 7 days Blue Bay. We were located few minutes’ walk away from the main building. Which at first, we were not too happy about however later we did apricate it. It was less crowded we always managed to find empty sunbeds. Bar wasn’t as busy as the bar in the main building and it was nice and quiet. Beach is just few minutes was from the hotel but it is very steep hill. Hotel provides a drive down in a car and they can bring you up too which was very convenient. View from the hotel is stunning. Entertainment was brilliant. Food was delicious. Staff very freindly and alwasy going an extra mile to help.